Just few days ago stock.nu published a post with charts showing that empirical distribution of daily lows follows a U-shaped pattern, i.e. daily low is not equally likely to happen at any time during the trading day, rather low is more likely to occur near the open or the close. Similar (symmetric) U pattern exists for distribution of daily highs - they also more likely to happen near the open or the close. This particular distributions of daily extremes is actually not surprising - it is one of the properties of random walk process. To re-phrase: if we were to simulate a random walk process, we would not see a uniform distribution of highs and lows throughout the day, rather we would see this U-shape pattern of highs and lows. This is theoretical distribution of lows (or highs) that we would expect according to the formula. If you compare it to the original (empirical distribution) chart, the numbers are quit similar. However I must note that I cheated a little bit: both the empirical chart from stock.nu and mine below have seven columns, but time intervals are not the same - in the top chart the first bar corresponds to the first half-hour, while the rest are one hour. In theoretical chart all time intervals are the same. So how much do these distributions really differ? If we recalculate the theoretical chart, we still see the U-shaped pattern, but it would look somewhat different from empirical. What explains the differences? Well - really one thing - there is a difference in trading activity in different parts of the day. 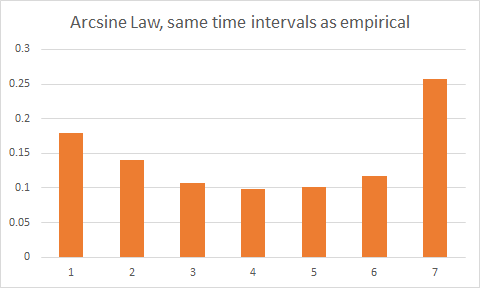 I speculate that if were to adjust the time intervals for equal trading volume, or equal number of trades, the resulting empirical distribution will be very similar. Check out my follow-up post. A couple of years ago I looked at the cumulative distribution for the time of day of the high (blue) and low (red) for the DAX. 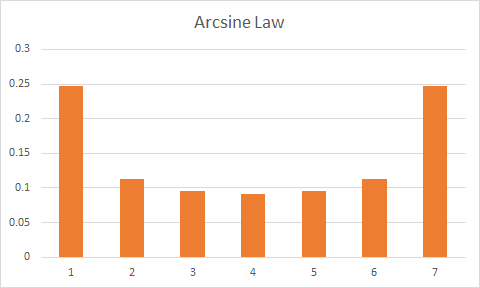 I also presumed the deviation from the arcsine law was due to the uneven volatility profile throughout the day, but it might be interesting to try and normalise for it. Interestingly the low tends to occur earlier than the high, although I don't know how statistically significant it is. I too did the same study 6 months ago on 30 min. intervals on about 10 years of data for 10 or 12 ETFs. there were more HODs/LODs in the 9:30 and 10:00 bins with 3:30 placing third pretty much acrcoss the board. I since I knew nothing of arcsine law, I assumed gaps were responsible for a big portion on the morning extremes and positioning for EOD was the reason for the hight 3:30 extreme count. Any thoughts on a strategy to buy on a reversal off an early HOD/LOD in the first hour thinking the odds are greater that the point would hold to ultimately become THE HOD/LOD.? @Rich, @Anonymous - see my follow-up post, there's definitely asymmetry, even adjusting for volume and arcsine law.